The big advantage of Section 529 college savings plans is that withdrawals used to cover qualified higher education expenses are free from federal income tax (and usually state income taxes too). That part is very easy to understand, but the full story on withdrawals is not so simple. What are qualified expenses? What happens if you take out money for expenses that aren’t qualified? You can direct the plan to make a withdrawal check out in the name of the account beneficiary (meaning the student for whom the account was set up, usually your child or grandchild). You can direct the plan to make a check out in your name as the account owner or plan participant (meaning the person who established and funded the account). Assuming the withdrawn funds will be used for the benefit of the account beneficiary (to pay for his or her college costs or for whatever other reason), having the check made out to him or her is the recommended option. If the money will be spent on college costs, you can have the beneficiary endorse the check over to you so you can control the spending. If you as the account owner will keep the withdrawn funds for your own benefit, having the check made out in your name is the recommended option. Handling withdrawals in this fashion makes it easier to “follow the money” for tax purposes. Beware: As a matter of state law, you’re not permitted to keep a withdrawal from a 529 account that was funded with money from a custodial account established for the 529 plan beneficiary (your child or grandchild) under a state’s Uniform Gift to Minors Act (UGMA) or Uniform Transfer to Minors Act (UTMA). In this case, the money in the custodial account belongs to the kid, and the money in the 529 account does too because it came from the custodial account. In other words, a 529 account that was funded with custodial account money belongs to the child for whom the custodial account was set up. Therefore, withdrawals must be used for the benefit of the child, and not for your own purposes. On the other hand, if you funded the 529 account with your own money, you can take withdrawals and do whatever you want with them because it’s your money. Just make sure you understand the tax implications. When a withdrawal is taken from a 529 account, the plan is supposed to issue a Form 1099-Q, Payments From Qualified Education Programs, by no later than February 1 of the following year. If withdrawal checks were issued to the account beneficiary, the 1099-Q will come to the beneficiary with his or her Social Security number on it. If checks were issued to you as the account owner, you will receive the form with your Social Security number on it. Line 1 of the 1099-Q shows the total withdrawn for the year. Assuming the account made money, withdrawals will include some earnings and some tax basis from contributions. Withdrawn earnings are shown on line 2 of the 1099-Q. They may or may not be tax free. Withdrawn basis amounts are shown on line 3. They are always free of any federal income taxes or penalties. The IRS gets a copy of the Form 1099-Q, so the government knows withdrawals were taken and who received them. When the 1099-Q shows withdrawn earnings, the IRS might become interested in looking at the recipient’s Form 1040, because some or all of the earnings might be taxable. Here’s how the tax rules work. Books and supplies, computer and Internet access costs. Expenses used to claim the tax deduction for college tuition and fees. When withdrawals exceed adjusted qualified education expenses, all or part of the withdrawn earnings will be taxable. This little-known fact is an unpleasant surprise for some people. Tax-wise steps: The parents should direct the plan to issue the withdrawal check in Ben’s name rather than their names. Then, the parents should have Ben endorse the check over to them so they can control the spending. That way, Ben will be issued the 1099-Q and will bear the tax consequences. Example: This time, assume Ben has $36,000 in adjusted qualified education expenses because he doesn’t receive any scholarships or tuition discounts. Since his qualified expenses do not exceed the amount taken from his 529 account, the withdrawn earnings are federal-income-tax-free. Therefore, the $6,000 is not reported on Ben’s Form 1040. Assuming the 529 account was funded with your own money (as opposed to money from your child’s custodial account), you are free to change the account beneficiary to yourself and take federal-income-tax-free withdrawals to cover your own qualified education expenses if you decide to go back to school. Earnings included in withdrawals that you choose to use for purposes other than education must be included in your gross income and will probably be hit with a 10 percent penalty (explained below). However, if you liquidate a 529 account that is worth less than you contributed (because of the stock market), there won’t be any withdrawn earnings, so you won’t owe anything to the IRS. You might even be able to claim a tax-saving write-off for your loss. As explained earlier, the earnings included in 529 account withdrawals that are not used to cover the account beneficiary’s qualified education expenses must be included in gross income. In other words, the earnings are taxable. But there’s more. According to the general rule, taxable earnings are also hit with a 10 percent penalty tax. However, the penalty tax does not apply to earnings that are only taxable because the account beneficiary’s adjusted qualified education expenses were reduced by Pell grants, tax-free scholarships, fellowships, tuition discounts, veterans’ educational assistance, employer-provided educational assistance or any other tax-free educational assistance (other than assistance received by gift or inheritance), or costs used to claim the American Opportunity or Lifetime Learning tax credit. In addition, the penalty tax doesn’t apply to earnings withdrawn because the beneficiary attends one of the U.S. military academies (such as West Point, Annapolis or the Air Force Academy). Finally, the penalty doesn’t apply to earnings withdrawn if the account beneficiary dies or becomes disabled. Example: Dave has a falling out with his daughter, who decides not to go to college. Dave liquidates her 529 account, which he funded with his own money, and uses the withdrawal to buy an expensive new car for himself. Assume the 529 withdrawal includes $8,000 of earnings. Dave must report the $8,000 as miscellaneous income on his Form 1040. In addition, he will be socked with the 10 percent penalty tax on the $8,000. Section 529 plans are one of the most popular ways to save for college. But in addition to knowing the rules for making contributions, it’s important to understand how you can get money out of a 529 plan with the best possible tax outcome. If you have questions, consult with your tax adviser. Choosing the appropriate legal form for a business is one of the first issues most entrepreneurs face. It is an important decision at the formation stage and also as a business grows. Sole proprietorships are generally the easiest. Corporations offer some different advantages, but often with additional complexity. This article addresses some of the pros and cons of different types of legal structures for businesses. Even if your enterprise has been in existence for a while, it may be time to review your options. There can be many complexities in determining the best legal structure and a qualified attorney may be of value when evaluating your choices. Ownership Rules One owner. Unlimited number of shareholders with no limit on the classes of stock. Up to 100 shareholders are allowed. Only one class of stock is allowed. Unlimited number of general partners. Unlimited numbers of general and limited partners are allowed. Unlimited numbers of “members” are allowed. Liability of Owners Unlimited liability for obligations of the business. Generally, no personal liability for obligations of the corporation. Generally, no personal liability for obligations of the corporation. All general partners are fully liable for obligations of the business. Unlimited liability for the general partners and no personal liability for the limited partners. Generally, no personal liability for obligations of the entity. Tax Treatment Entity is not taxed, all income and losses passed through to owner. Corporation is taxed at the corporate level. Shareholders are taxed on any dividends received. Entity is not taxed; profits and losses are passed through to the shareholders. Entity is not taxed, all income and losses passed through to partners. Entity is not taxed; profits and losses are passed through to the general and limited partners. Entity is not taxed; profits and losses are passed through to the members. Control and Management Sole proprietor manages the business. Board of Directors has overall management responsibility with officers having day-to-day responsibility. Board of Directors has overall management responsibility with officers having day-to-day responsibility. General partners have equal management rights unless they decide otherwise. General partner manages the business subject to the Limited Partnership Agreement. The Operating Agreement describes how it to be managed. A Manager is usually designated to manage the business. Capital Contributions Sole proprietor makes any capital contributions as needed. Easiest. Shareholders usually buy stock in the corporation. Corporation can issue common and preferred stock. Shareholders usually buy stock in the one class of stock issued by the corporation. General partners contribute money or services to business and receive interests in profits and losses. Both general and limited partners contribute money or services and receive interests in the profits and losses. 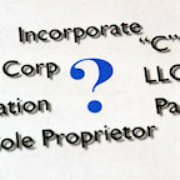 The members typically contribute money or services to the LLC and receive an interest in the profits and losses. Ease of Establishing Easiest. Must file Articles of Incorporation with the Secretary of State. Must file Articles of Incorporation with the Secretary of State. No filing. But a partnership agreement is needed. File an application with the Secretary of State. File Articles of Organization with the Secretary of State. A shareholders agreement drafted for a privately held company details the rights and obligations of the shareholders. It not only provides guiding principles for running the business today, it lays out the ground rules of what to do if one of the shareholders dies, becomes disabled — or one party wants to dissolve the business. Is the price based on book value, fair market value based on the company’s assets and liabilities or another method? Will a shareholder’s shares be sold only after the business or other shareholders have the first election to purchase them? Will a disabled shareholder’s shares be sold only after the business or other shareholders having the first election? If not, must shareholders be offered new shares in proportion to their interests so they won’t be diluted? What limitations will be placed on shareholders’ ability to compete — especially if they sell shares or leave the business? What if some of the shareholders want to sell the business but the others don’t? Effective July 1, 2014 through June 31, 2022 businesses at least 50% engaged in manufacturing or research and development (R&D) in biotechnology, physical, engineering and life sciences may claim an exemption from the California state sales tax at the current rate of 4.1875% (local/district taxes still must be paid). 3. Property that is normally replaced at intervals of one or more years. Further, the amendment provides that the above useful life provisions apply even if the taxpayer has expensed the purchase. The BOE intended to address potential ambiguity given that the original version of the exemption did not specify whether a qualified person who currently deducts the entire cost of otherwise qualified tangible personal property that actually has a useful life of one or more years is “treating” such property as having a useful life of less than one year or a useful life of one or more years for state franchise and income tax purposes. the result of this amendment could represent a benefit for certain business, particularly smaller ones, that may not capitalize all equipment. In conclusion, taxpayers in the R&D and manufacturing spaces could potentially benefit from the exemption on certain equipment purchases, regardless of whether they expense or capitalize the equipment purchased. For additional assistance to understand this new tax benefit, please visit the above BOE website, contact the BOE directly by email or phone, or contact Richard Huffman, CPA, MST tax partner at Wright Ford Young & Co. at rhuffman@cpa-wfy.com.